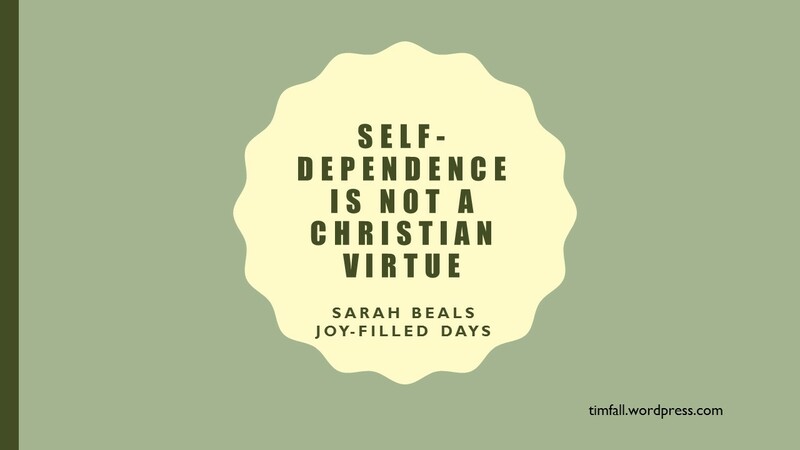 This entry was posted in Uncategorized and tagged God's grace, Joy-Filled Days, Sarah Beals, self-dependence, self-sufficiency. Bookmark the permalink. This has been my life scripture for the past 6 years or so… it’s powerful if you live by it. That quote reminds me of a book title I saw recently: “God Helps Those Who Help Themselves – And Other Things the Bible Doesn’t Say” (sounds like my kind of book!). One may call it faith, another -(gasp) laziness. Another time when we need to fully understand the meaning, application, and proper use of this word –BALANCE. The most important way to do this with daily frequent contact with HIM. He has given me answers when none could be found, yet at times he has allowed me go through the struggle to find the answer. Eliminating the story, God told the man that he sent two boats and a helicopter, what more do you want. I’m afraid you lost me, PB, except for the part about staying in contact with God throughout each day. – A friend of mine had to deal with an adult child who would not look for work nor attend college. “God will provide Dad! was the response. He had to make some tough choices, and the challenging young adult got it. The takeaway for that was God seems to work best with those plan and work. Sounds like SELF-DEPENDENCE. A man was advised to evacuate, the flood waters were rising. When the roads became impassable, a boat met him at the porch of his house, he said no thanks, God will provide, I have faith. Waters are higher, he in a higher window, another boat, same answer. He is now on the roof, a helicopter came, same answer. He is now face to face with God, He asks why God did not provide a way out. Far too many will not do -period. Having seen many who would not do anything unless God told them what to do, and seeing nothing get done, I am challenged by the premise. I see it as God giving us responsibilities that we carry out, but we rely on him for the abilities to do it. Very true aspect of our lives today. We celebrate 31 years of marriage, but have the worst financial situation in front of us ever. Lazy we aren’t, but an employer is paying nothing, I have no work, and we are hitting 60s. Happily, I believe God has this all under control and there is nothing better to do than trust and wait to see another of Gods gracious acts in our lives. We have one thing to do….trust…..and be waiting confidently on His mercy. We will overcome, so the Lord told me during a prayer and quiet time, and I have a happy heart and good times ahead in the Lord. I’m praying God will deliver you soon from these straits, Ruth. I feel that pain as many have faced lowered income for many reasons. Those who can but do not are not in the same category as those who are unable but persist in trying. Adding my prayers as well.